A sinkhole has appeared on New Lane in Eccles. The road is closed from the A57 to Beech Street. Police say the road is likely to remain shut for two days. Police are searching for a missing 77-year-old man who was dementia. Anthony Lee has been missing since Friday evening. He was last seen at the Morrison's supermarket in Eccles town centre. Police think he may have taken the Metrolink, but it's not known where to. Anthony is white, and described as around 5ft 6in tall, of stocky build and with white/grey hair combed back. He has a slight squint in his left eye, is hard of hearing and has no teeth. He was last seen wearing a black Adidas jacket, a blue t-shirt, blue trousers and black pointy dress shoes. Anthony has not taken important medication and his family are incredibly concerned. Anyone who has any information that could help police find Anthony is asked to get in touch as soon as possible on 0161 856 5420 , alternatively call 101. 39-year-old Aftab Khan of Millers Street, Eccles is wanted on recall to prison after serving part of a sentence for sexual assault. Khan has been outstanding since Sunday August 5, and all efforts to trace him so far have been unsuccessful. Two men linked to the gang that killed a man from Salford while he was on an aid mission in Syria have been captured. Alan Henning was 47. £173K to be recovered from a man who used money from selling drugs to buy a Tapas bar in Eccles. A plane has crashed next to the M62 motorway moments after it took off from City Airport in Eccles, Salford. High-rise tenants in Eccles want "to know they won't burn in their beds"
Residents in high-rise blocks in Eccles want reassurances they are "not going to burn in their beds", says one angry tenant. Tony Ormonde, 62, lives in Cremer House which is one of seven blocks in the town run by housing assocation City West Housing Trust that failed Government fire safety tests on cladding in the wake of the Grenfell Tower tragedy. They are among 29 tower blocks in Salford to not pass the combustibility tests, the highest of any local authority area in England disclosed by the Department for Communities and Local Government (DCLG). "They want to be satisfied that they are not going to burn in their beds, basically." City West confirmed on Wednesday the removal of the cladding had been suspended. “Customer safety is our absolute priority and since the fire at Grenfell Tower we have been open with customers and shared information with them as it has become available. “We now know that although the cladding systems we have in place meet current regulations, the Aluminium Composite Material (ACM) panels tested have not met the latest Department for Communities and Local Government (DCLG) test criteria. “The advice around ACM panels and cladding systems is now somewhat unclear and until this is clarified we have taken the decision to suspend the removal of affected ACM cladding. We will not be starting the removal on any further blocks. “This will remain the case until we have clearer guidance on the kinds of panels we can use as a replacement and we are certain that removing the affected panels is the best and safest option. “Customer safety and peace of mind is our highest priority and this decision has been taken following a full review of the facts we have available. We are writing to customers to let them know this current position and to provide assurance and a point of contact should they have any questions. “In the last week the fire service have visited all 12 high rise blocks in Eccles and carried out detailed inspections in order to attain assurance about the fire safety arrangements on all 12 blocks and the measures we have in place. Work to remove aluminium composite cladding from nine blocks in Pendleton, in Salford, continues. In an update on its website on Wednesday, housing association Pendleton Together said the work was being overseen by an independent fire expert. It said: "In the first instance we will be removing cladding as far up as it is safe to do so. "As soon as we have a timescale of works confirmed with our contractors we will provide residents with further information." Another housing association, Salix Homes, said last week cladding was being removed from three of its blocks in Salford, while work would take place in the coming weeks on five further blocks after it said they had been "identified as having a lower risk than many other samples tested across the country". 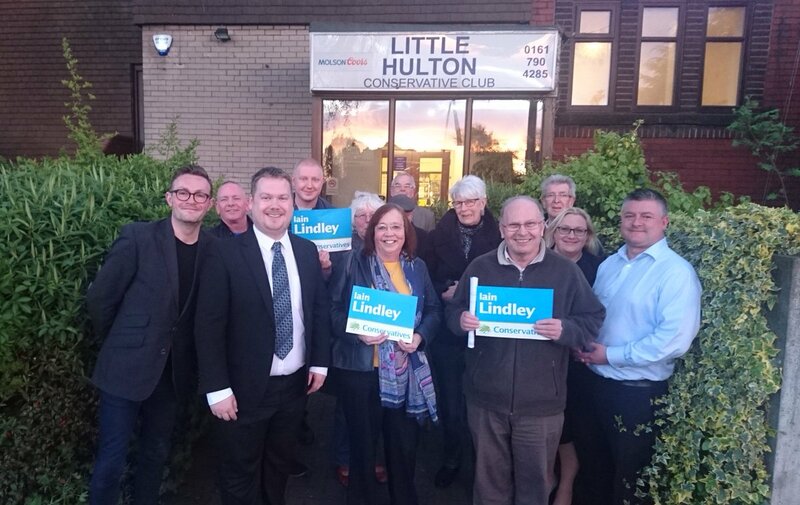 Councillor Iain Lindley has been selected as the Conservative party candidate for the Worsley and Eccles South seat in the upcoming General Election on June 8th. Police have now released the footage and want to speak to the group of people in connection with the two robberies.